In an earlier post (my most popular), I shared Ten Ways to Cook Turnips. Today, I present this collection of simple, vegetarian recipes made with natural ingredients. This one contains many ingredients but is not as complicated as it looks–Couscous with Seven Vegetables in My Excellent Couscous Adventure. If raw turnips are your thing, try Grated Turnip and Apple Salad. Via JustVegetableRecipes. Marinated Turnips use only five ingredients and can easily be prepared in advance. Via JustVegetableRecipes. If medieval recipes are your thing, why not try Rapes in Potage? Rapes are another name for turnips. Here’s something a little different: Vegan Shepherd Pie, via Leora. Reader Tanya shared Unstuffed Rutabagas or Turnips, layered with ground beef or lentils and rice. Try Roasted Turnips with Balsamic Vinegar from Kalyn’s Kitchen. Try this recipe for turnips with sage and apple, Turnips with or without Greens, via Healthy Living for Ordinary People. You can’t get any easier than putting all the ingredients into the pot and turning it on: Tomato, Noodle and Turnip Soup. Via JustVegetableRecipes. Mimi from Israeli Kitchen gives simple directions for cooking Glazed Turnips. What’s your favorite turnip recipe? Please share in the comments. You can also ferment turnips. You can shred them like cabbage and make a sauerkraut out of them, called sauerruben. I haven’t done it with turnips yet, but I did ferment parsnips, and they were delicious. Rivki, thanks for sharing your recipe. I think turnips are really under-appreciated! Thanks for including my recipe for Roasted Turnips with Balsamic Vinegar. Thanks for mentioning my glazed turnips, Hannah. Going through the other recipes here, I’m getting inspired for my next turnip adventure. All these recipes look delicious. 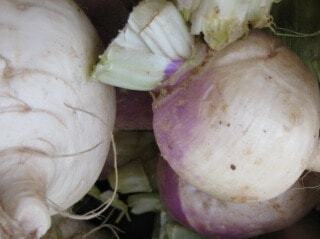 In New England at this time of year, rutabagas are more common that turnips. They’re also larger, sweeter and pale orange. But in other respects they’re very similar. I’m going to try some of these recipes with rutabagas! Ms. Krieger, let us know how they turn out. Hi Jane, Let me know what you like!